A couple of weeks ago the first over-wintering trumpeter swans began flying overhead in small groups of four or five. Their ethereal trumpeting, along with a few storms and the quickly dipping mercury, are a sure sign that Old Man Winter is slowly wrapping his gnarled hands around the farm. As I sit here typing the wind is gusting wildly, rocking the tiny house on its tractor-trailer foundation. While Andrew and our part time farm hand William run around taking apart now-empty animal enclosures and gathering loose items that are blowing about, I sit here in the warm house with the excuse of fire-tender; we have many pounds of hog lard to render and keeping the fire alight is a very important task! Speaking of hogs, all eighteen of our wonderful pig friends have been slaughtered over the past few weeks. The hogs are a huge part of our farm and bring a lot of character, so when they are first gone I feel their absence acutely. Someday soon we would like to breed our own hogs, and at that point we would have permanent pig residents to amuse us. For now the cycle of pig life on the farm is relatively short, but ends in a year’s supply of healthy, delicious pork. Many of our customers do not claim the leaf fat from their pigs once at the butcher, and so Andrew and I are happily collecting the leftovers for our own use and for gifts. Hog lard is making a comeback people: mark my words! Today also marks the first goat slaughter of the season. Andrew performed this task himself, and I am so proud of how efficiently and humanely he accomplished this. This man I married never ceases to amaze me. He continues to learn new skills every day, and is constantly pushing himself to be better. If I only had half the drive he has we could conquer the world! Fortunately we’re happy just plodding along on our fertile little patch of borrowed land in this gorgeous valley. Who needs the world when you have everything you need just steps away from your front door? As winter approaches we are trying to get things ready, doing what we can to prepare for the cold. We need to cut more hardwood for heat, and insulate the pipes coming out of the new well. We need to dig up and store our carrots, beets, and dahlia tubers in sawdust to protect them from freezing. On the back burner are plans to filter our water system and get the hot water heater back up and running. In the meantime we’re still hauling in our drinking water and taking showers at the neighbor’s. I started washing dishes part time at a nearby winery (the chefs were CSA members this season and are so fun to work with! ), and I’ve gotten into the habit of brining my own dirty dishes with me. Having copious amounts of hot running water right out of the tap is a luxury I am still struggling to get used to. In my last post I mentioned I was going on vacation to visit my sister and her new baby, along with some other family members. We had a great time in beautiful Autumnal Maine, enjoying the newest addition to the family and eating our way around Portland. Little Juniper is adorable, a perfect mash-up between my twin and her husband. It was surreal and amazing to watch the girl I grew up with mothering her child. I wish we lived closer so that I could watch Juniper grow, but photos and video chats will have to do for now. Despite kind of living as if we’re still in the 19th century, Andrew and I suffer that great dilemma most modern American families face: dispersion. We’d love to have everyone all living together on one big bustling farm, but for now we’re thankful for the technology that allows us to stay connected. Typically wintertime on the farm is spent planning and plotting our next moves. Things are going to be a little bit different for us next year, and we have a lot of work to do in order to get ready. 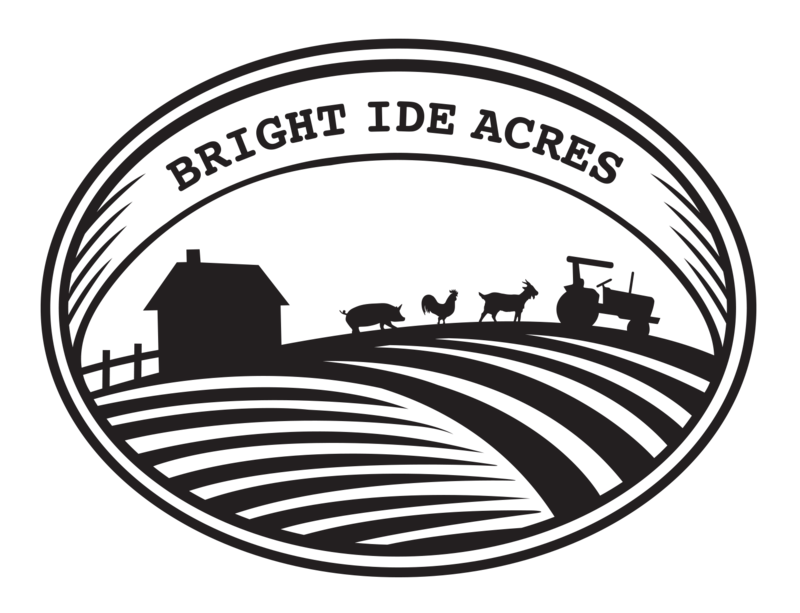 Our passions lie in humane animal husbandry, and we’re looking forward to making that our main mission at Bright Ide Acres. While vegetables will always be a part of our own homestead, the availability of healthy, organically grown produce is widespread in this part of the world. Ethically raised meats are harder to find, and the demand for this niche product is increasing. With the rise in consumer awareness about the factory meat industry and how much more nutritious and environmentally friendly pastured meats are, we feel there is a good marketplace for us. One big challenge for selling meat products is that the regulations required for selling cuts are proving prohibitive for us. I am adamant about having animals slaughtered on the farm rather than subjecting them to stressful transport and slaughterhouse conditions. Right now all of the large animals that are slaughtered for customers are done so under a custom arrangement, which is great for people who have the freezer space to take a half hog or quarter cow. Our mobile butchers are not USDA certified, which means we can’t take back the meat and resell it as bacon or pork chops at farmers markets or to restaurants. While some neighboring counties have USDA certified mobile slaughter units, our county currently does not. Unfortunately many potential customers in Seattle and surrounding areas, (who have both the desire to support ethical meat and the means to do so), don’t have big freezers in their apartments and townhouses. Our goal is to find a way to create a meat CSA or cooperative whereby we can provide monthly (or so) boxes with various cuts of different animals, eggs, and honey. Another difficulty will lie in advanced funding, since most of the revenue made from animal products don’t come until after slaughter, which is later in the season. I have been mulling the idea of a Kickstarter campaign or something similar, since I know a lot of you might be interested in supporting us in our endeavors. Please let me know if a comment if you have any ideas or suggestions for farm fund-raising! I hear some sizzling from the lard pot, so it’s time to go stoke the fire and add more fat. I hope all of you across the country stay warm during the brutal week that’s predicted ahead. If you’re feeling down about the weather I can recommend some homegrown beans simmered in a dollop of trotter gear, (gelatinous pork stock made from pig’s feet! ), to keep those winter blues in check. There’s really nothing better than a steaming mug of homemade chili on a cold blustery day! Meghan and Juniper pose with the blocks I made for my adorable little niece! Nothing quite like snuggling a sleepy babe! Some crazy rainbow leaves from a cool tree on a hike in Maine. The pigs enjoyed the copious mud these last few weeks. Andrew, our neighbor Ross, and I went on a canoe trip down the Snohomish before the river got too swift. We saw harbor seals! A shot at dusk from the canoe. So many rainbows make an appearance on the farm! Because what’s a blog post without a cat photo? And what’s cuter than a cat in a box? Ok, maybe my adorable husband giving a belly rub to a pig is cuter than a cat in a box. Maybe. I spotted this injured young great horned owl in the brambles. Andrew pulled it out and we took it to a wildlife rehab center. While pulling Sam’s shack out of the field we had a little mishap and lost the skids! Some clever engineering later and we had the thing up on a trailer. That’s me in the big tractor! We’re going to be using this shack as a chick brooder for the 170 layer chicks that arrive in a couple days! My chef pals Kristin, Julie, and I were the Three Amigos for Halloween. We made those costumes a mere 24 hours before the big night! I truly enjoy reading about you and Andrew’s life. Please be sure that IF you decide to “Kickstart” I will gladly donate… May not be tons but it will be donated with love for my “Ide” family. We would absolutely support a kickstarter! We have been massively enjoying your amazing chickens and will definitely be hitting you up for more next season as well as a whole pig. Thank you for doing what you’re doing! !